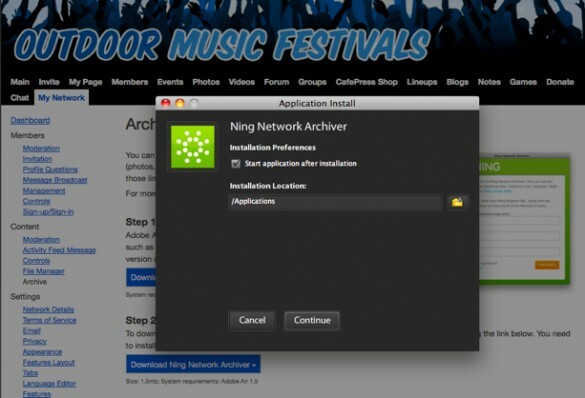 As a Network Creator, you can archive the content on your Ning Network.Â In order to do this, you will need to download the Ning Network Archiver Application, which you can run with Adobe AIR. To get started, go to the My Network tab, thenÂ click the “Archive”Â button under theÂ “Content” heading. If this is your first time usingÂ the Ning Network Archiver, thenÂ you will need to install Adobe AIR on your computer.Â You can download the latest version of Adobe AIR for free at https://get.adobe.com/air/ or by clicking on the “Download AIR” button on the Archive Content page.Â You can read the system requirements for installing Adobe AIR here.Â If you’d like to learn more about Adobe AIR, check out these FAQs. 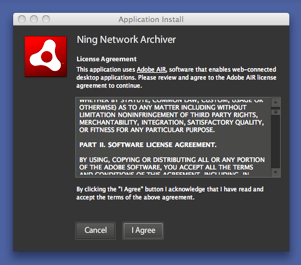 After you have AdobeÂ AIR installed on your computer, click “Download Ning Network Archiver” from the Archive Content page. You can also download the Ning Network Archiver directly from this link.Â Download the Ning Network Archiver, and save this application to your computer.Â As with any new application, you may be asked to enter your computer’s password before you can download the Ning Network Archiver.Â When the download is complete, the Ning Network Archiver will be saved as an application with the file extension .air. You should then see a new window with your Installation Preferences.Â If you’d like to begin archiving your content, check the “Start application after installation” checkbox, and choose an Installation Location.Â Click “Continue” to proceed. Next, you’ll see our License Agreement.Â Click “I Agree” when you are ready to proceed. Now you are all ready to begin archiving your content!Â Learn how to use the Ning Network Archiver application here.